The problem: she’s seventeen, female, and it’s 1841. Mourning Free knows how to run a farm and Olivia has complete trust in him. The problem: he’s the orphaned son of runaway slaves and reluctant to travel and work with a white girl. He especially fears the slave catchers who patrol the free states, hunting fugitive slaves. Not without qualms, they set off together. All goes well, despite the drudgery of survival in an isolated log cabin. 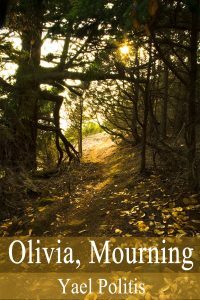 Incapable of acknowledging her feelings for Mourning, Olivia thinks her biggest problem is her unrequited romantic interest in their young, single neighbor. Then her world falls apart. Strong-willed, vulnerable, and compassionate, Olivia is a compelling protagonist on a journey to find a way to do the right thing in a world in which so much is wrong. I enjoy exploring another time and place. When writers are told "only write what you know" I would change that advice to "write about something you'd love to learn about." I had also become preoccupied by my belated realization of how vulnerable we all are, how life can change in an instance. I never really knew my great-grandmother, who died when I was five or six, but I read and heard a lot of stories about her. She had a tough life – orphaned at an early age, married to a not abusive but harsh man who was not a great provider, and then a penniless widow. She found a number of ways to support herself, among them producing the Greenstreet Paper Dolls with her sister. Obviously, the details of her life were not like Olivia's, but it was my image of her I had in mind when I wrote about Olivia. In the 19th century a wagon couldn’t cross Pennsylvania without circumventing the worst of the Ridge-and-Valley Appalachians. Despite the breathtaking beauty of the lush green mountains, travelers gave a prayer of thanks when they finally made it past the Allegheny Front. There the plateau fell to the lowlands, into what some folks still called Westsylvania. Flat ground had never looked so good. Some of those wagons later took a wrong turn and clomped across a charming covered bridge. Thank the good Lord Almighty, those drivers thought. Nice bridge like that, there must be a town ahead. And there was – Five Rocks. It offered one of everything they needed – Livery, Feed & Grain, General Store, Saloon, Doctor, and Lawyer – along with a choice of three churches. But none of these accidental visitors (for no stranger came to Five Rocks by design) stayed for more than a night. On their way out they clucked their tongues and wondered what on earth had possessed those folks to build their homes on what seemed to be the only ugly patch of ground in all of Pennsylvania. The few trees were gnarled and bent over, and not even weeds thrived in the hard-scrabble gray dirt. Olivia Killion’s father, Old Man Seborn Killion, was the owner of Killion’s General in Five Rocks. She and her two older brothers, Avis and Tobey, lived with him in one of the eight “rich folks’ houses” on Maple Street. Olivia had attended the one-room schoolhouse until she was past fifteen, when her father’s illness put him in bed for good. She knew it was her place to stay home and care for Old Seborn. Since then, for two long years, every morning had been the same – heat up water and fight past his flailing arms to bathe some part of him, while he hollered that she was trying to give him pneumonia. He was more cooperative while she fed him his breakfast. Afterwards she sat staring out the window while she listened to him complain. In the afternoons Olivia read to him and did her best to put off pouring the shots of whiskey he demanded. When he began drifting in and out of sleep she passed the time reading or trying to dredge up memories of her mother. In Olivia’s imagination Nola June floated up and down the staircase, always draped in a flowing garment of warm colors, her head topped with a mist of blonde curls. It was her mother’s face Olivia couldn’t remember. Olivia had come to see her life as a never-to-end procession of such days, until a cold morning in late January 1841. Carrying a pitcher of hot water and a clean towel, Olivia nudged her father’s door open with her hip, wondering how bad he was going to be. Some water sloshed onto the floorboards, and she prepared herself for one of his looks. His tiny yellow eyes had a way of glaring that was worse than yelling. She knew he was gone without looking at him. The room was silent and smelled of the waste he had evacuated. She set the pitcher and towel on the bureau and turned toward the bed. He lay with his arms at his sides, under the blanket, as if he had tucked himself in. His head was thrown back, his mouth hanging open and revealing tobacco-stained teeth. At least his eyes were closed. She dried her hands on her apron and stared at him, shamed by the first thought that rushed to mind – no more baths. And no more washing out the green and brown lumps he spat into china teacups. Or helping him onto the chamber pot. She searched her heart for grief, but was unable to think of a single reason to wish him back alive. Not for his sake, and not for hers. Not that she hated him. There wasn’t anything about him to hate; but neither had there been much to love, even before he got sick. And he had taken such a dreadful long time dying. Olivia yanked the window open and went to the top of the stairs to call her brother Tobey. Tobey stopped at the foot of the bed and stood rocking back and forth on his heels as he said, “Well, we’re orphans now. That’s what we are.” Then he went down to tell the housekeeper, Mrs. Hardaway. “Well, I don’t think it’s necessary to give double pneumonia to the spirits of the living,” he said and slid the window shut. Mrs. Hardaway waddled into the room and put a hand on Olivia’s shoulder. “There, there. Thank the good Lord for taking him peacefully in his sleep. Tobey, you go get Doc Gaylin. And stop by the store to tell your brother. He’d better bring a load of eats back with him. You’re going to have a mess of folks coming in to pay their respects.” Olivia glanced at Mrs. Hardaway in surprise, having forgotten that death was a social event. “I’d better get him cleaned up,” Olivia said, bracing herself. Olivia put her arms around the housekeeper and nearly cried with gratitude, which she knew was mistaken for grief. She had been dreading this final task. Not the stench of the filth; she could stomach that. But she had never seen Old Seborn naked. She’d always handed him the cloth so he could wash himself “down there,” under the covers. By the time Mrs. Hardaway finished cleaning Seborn up and removing the soiled sheets Tobey had returned. He and Olivia pulled chairs to the bedside and waited for the doctor and their brother Avis. Olivia slipped her hand into Tobey’s. “You feeling alright?” he asked. “Me too. And ashamed of feeling that way.” Olivia stared at the floor. “Thing you like best about me is I’m not Avis,” Tobey said. “Can’t help what you feel,” Tobey repeated. The stone chimney ran through their father’s room, so it was the warmest in the house, but they could still see their breath. Olivia couldn’t blame her father for never wanting her to wash him, but now that all the busybodies were going to be parading around him, whispering and shaking their heads, she wished he didn’t look so neglected. Olivia thought about giving him a quick shave, but the impulse didn’t manage to evolve into action. She felt as if a heavy mantle of exhaustion had settled over her. The next four days, until they lowered her father into his grave, passed in a blur. After the funeral Mr. Carmichael, the town’s attorney, came to the house to read the will. There were no surprises; the store and house both went to the oldest son, Avis. Olivia sat and listened, slowly beginning to comprehend her new situation. Olivia turned left onto Main Street, toward the row of weathered clapboard shops and offices. The smooth white crust of snow was not perfect – a few lonely trails of footprints had disturbed it – but it managed to make the dingy little town picturesque. Five Rocks had not benefited from the talents of a town planner; structures went up wherever any of its 768 residents chose to put them, and the slipshod façade of Main Street was one of the unfortunate results. As she trudged along Olivia silently scolded Old Seborn. So what if Avis is the oldest son? What about Tobey and me? There’s no law says a man can’t leave anything to his younger son and daughter. Did Avis spend the last two years taking care of you? I’d like to see him try giving you a bath, the way you batted your arms around, like I was trying to kill you. I’m the one with the bruises. Parents are supposed to take care of their children. All their children. Don’t expect me to feel guilty for looking out for myself. If I don’t, who will? Not you, that’s for sure. She stopped for a moment and listened to the silence, the only sounds her labored breathing and the muffled clop of horse’s hooves. She felt herself growing clammy inside the thick coat, more from anxiety than the exertion of the walk. She’d never had a conversation with Mr. Carmichael and felt suddenly shy. What was she going to say to the lawyer? Why had she come so early? He probably wasn’t even in his office yet. But when she looked up she saw curls of smoke rising above the tin roof. She hoped he was alone, no busybody in there to go blabbing about her coming to see him. She stared at the trails of footprints – two leading toward the office and one away from it – and hoped they had been made by Mr. Carmichael and a client arriving and the client leaving. She paused before stepping up onto the wooden sidewalk, afraid of tripping. The drifts were so high she couldn’t tell where the boardwalk dropped off, so she lifted her coat and skirt and kicked at the snow until she could see the edge. In the process she managed to get a boot full of snow, which quickly melted and soaked her already frozen foot. A pang of self-pity stabbed through her and she thought, why do I have to do this alone? Why am I always alone? For a moment she imagined the forlorn figure she must present – draped in black, stark against the glare of the snow, with the rust-colored splash of Tobey’s wide-brimmed felt hat on her head. She remembered the heavy oil paintings that hung in the public library over in Hillsong and could imagine a similar one of her, its neatly lettered caption reading “Orphan in Snow.” She clenched her jaw tight and stepped onto the walk, determined that no one was going to go around feeling sorry for her. If she couldn’t get that land, she’d just have to get a job. Seventeen was old enough. She ran her favorite refrain through her mind – There’s no reason why things have to remain the way they are. She unwound her scarf and removed the floppy felt hat, feeling defensive about her choice of headgear. Well so what, she thought. A man’s hat might be inappropriate for a young lady, but who wants to traipse around in a woolen bonnet when it might snow? You can’t go five paces before it gets all stinky and itchy, like wearing a dead possum on your head. And a poke bonnet? Bosh. Horses don’t like having blinders on them. Why should women? Some men used those stupid bonnets as an excuse for saying women ought not to be allowed outside alone, lest they get run down in the road. Almost as bad as the way the Chinese purposely crippled those poor women Miss Evans had taught them about, hobbling around on their bound feet. She tried to clear her mind and compose her thoughts. She wanted the lawyer’s advice, not disapproval or pity. She folded her scarf, removed a glove to run her fingers through her dark hair, and rapped on the door. Inside a chair scraped and the door was opened by a young man of Olivia’s age, wearing threadbare overalls and a bulky blue sweater. He smelled of tobacco and a body badly in need of washing. “Billy Adams. Hullo. What are you doing here?” Olivia knocked the snow from her boots and wiped them on the rag rug before entering. She cast curious eyes around Mr. Carmichael’s simply furnished office, having expected it to be grander. Chairs sat behind and in front of a large wooden desk. In the corner stood a bookcase and an iron stove, with two more chairs in front of it. “Don’t you need schooling for that?” She tugged at the fingers of her other glove as she moved closer to the warmth of the stove. Olivia kept her coat on and sat down, while Billy reclaimed his seat behind the desk. She stared as he ran stubby fingers through his greasy blonde curls. He had never joined in with the other children when they made fun of her mother so she bore him no ill will, but, even so, resentment rose in her. I was always the best pupil in class, she thought, and this blockhead, who didn’t even learn his letters until he was ten, is the one who can become a lawyer. It isn’t right. It just isn’t right. I can yap my jaw as good as Billy Adams. Feet stomped on the sidewalk and the door opened, letting in a fresh gust of cold air. Mr. Carmichael entered, enfolded in a wide black coat and carrying a cracked leather case. He was tall and so thin and pale that Olivia thought she could just about see through him. Whenever he walked past the schoolyard, elbows and knees protruding in all directions, the children shrieked, “Ichabod Crane, Ichabod Crane,” and fled in mock terror. He set his case down, hung his coat on a hook, and removed his top hat, revealing the dull black curls that framed his receding hairline and long white face.